Liposuction is a cosmetic surgical procedure in which fat is suctioned out of the body from specific areas. Also known as suction-assisted lipectomy or lipoplasty, it shouldn't be considered weight loss surgery—though you may lose some—because its goal is to reshape and redefine the contours of the body in areas that are not responding to diet and exercise. An ideal liposuction candidate will also have good skin elasticity and muscle tone. In fact, if a patient has already lost a significant amount of weight and has a lot of loose hanging skin, liposuction may only worsen those problems. Liposuction can’t take off that extra 50 pounds you’ve put on over the last 10 years. Generally, the amount of fat removed during a typical liposuction surgery ranges from 1 to 10 pounds. While larger amounts of fat can be removed, large volume liposuction is associated with increased safety risks, skin rippling, and contour irregularities. Liposuction will usually not reduce the appearance of cellulite. However, there are some newer treatments that show promise in this regard, such as SmartLipo, acoustic wave therapy, and the Rejuveskin procedure, any of which may be able to be performed as an adjunct to traditional liposuction. Call your surgeon immediately if chest pain, shortness of breath, unusual heartbeats or excessive bleeding occur after the surgery. 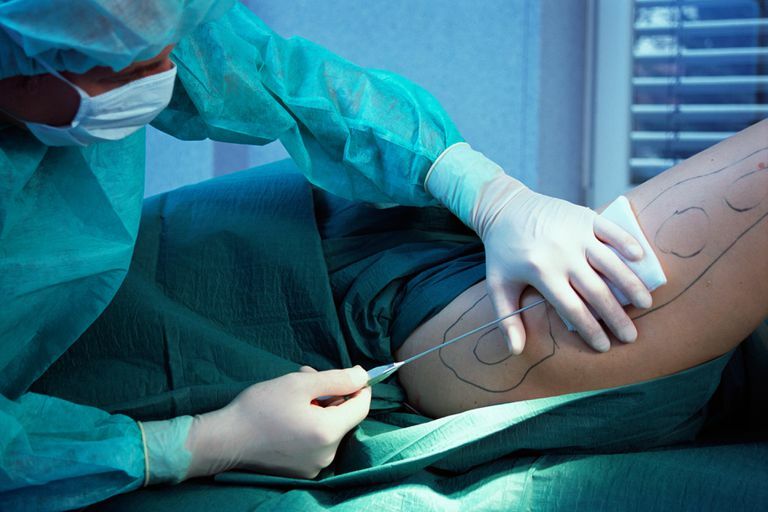 The total cost of liposuction varies widely depending on the size and number of areas being treated, as well as the specific techniques used. The range per treated area is usually between $2,000 and $4,000, but it can be as wide as $1,500 to $7,500. The cost discrepancies have to do with the complexity of the procedure, your geographical area, and your surgeon’s skills, qualifications, and reputation. According to the American Society of Plastic Surgeons, the national average cost for liposuction in 2014 was $2,971 — not including anesthesia and other fees. Surgeon’s fee, anesthesia, facility and lab fees, medications, and compression garments, are often added to the cost of the procedure. Some surgeons may even offer substantial discounts if multiple areas are done in the same surgery. Since many women look to liposuction as a way to balance out the proportions of the body, it is often done in conjunction with a breast augmentation or breast lift. Furthermore, for patients who also have loose skin in addition to excess fat in some areas, a tummy tuck or body lift procedure may be performed to enhance the patient’s overall result. For some, a breast reduction (via traditional techniques or via liposuction) may be chosen as well. Your surgeon will examine you and order pre-op lab tests to confirm your health status. This examination will include a full health history and most likely a detailed weight history. He or she may also require that you adjust, cease, or begin taking certain medications—avoiding aspirin, many anti-inflammatory drugs, and herbal supplements—for 2 weeks prior to surgery. On the day of your procedure, have someone drive you to the facility. There, your surgeon will take pre-op photos and mark targeted areas on your body while you are standing. Then, you're prepped for surgery. IV fluid lines will often be put in place to help regulate fluid levels during surgery. In addition, you will be placed on monitors to keep track of heart rate, blood pressure, and blood oxygen levels during the procedure. Anesthesia is administered for your comfort during the procedure. Sometimes, a general anesthetic is used so that you will be asleep for the procedure. However, liposuction may also be performed using a combination of local anesthesia and intravenous sedation. Your surgeon will recommend the best choice for you. Incisions are made. These very small incisions (about 1/8- to 1/2-inch each) are made by your surgeon in natural body creases whenever possible so that will be well hidden. Often, when treating larger areas, there are multiple incisions made for each treated area. Fat is prepared for suctioning. There are a variety of techniques available to today’s plastic surgery patients. The fat is suctioned by small hollow metal tubes, called cannulas, that are inserted through the incisions. The cannulas are moved in a controlled back and forth motion to loosen and suction the fat, which is drained through the tubes into waiting receptacles. Incisions are closed with surgical sutures. In some cases, small tubes will be placed at incision sites to help drain excess fluid. Once the procedure is finished, you will be taken to a recovery area where you will likely be given a compression garment to wear to control swelling in the treated areas and help your skin conform to your new body shape. You will likely go home after a few hours unless your surgeon determines that you need to stay in the facility overnight. When you do go home, arrange for someone to drive you there and stay with you for at least 24 hours. Most patients can return to non-strenuous work, such as a desk job, after just 2 to 3 days. Strenuous work or exercise should not be resumed until at least 2 to 3 weeks have passed, depending on the extent of your procedure and which areas have been treated. As with all surgery, it is important to understand that these guidelines can vary widely based on a patient’s health, the techniques used, and other variables surrounding the surgery. Regardless, it is important to take care not to subject the incision sites to excessive force, abrasion, or motion during the healing period. Report any severe pain to your doctor. Post-op swelling and bruising can be significant with liposuction, so results can not be fully judged for a period of at least 1 to 3 months after surgery. While most bruising will fade within 2 to 4 weeks, some residual swelling may take as long as six months to resolve fully. Today’s liposuction normally involves the use of very small incisions, which usually fade over time to be virtually undetectable. The intended result of liposuction surgery is a more refined contour and better-balanced body proportions. Liposuction, Consumer Information Sheet, American Society of Plastic Surgeons. Liposuction (Lipoplasty), Consumer Information Sheet, American Society for Aesthetic and Plastic Surgery.